Small group training (SGT) ranks among leading profit centers at most health clubs. For some clubs, it’s nearly tied with personal training as the top profit center. IHRSA’s Profiles of Success shows that leading fitness-only clubs derive a median of 8.8% of total revenue from personal training and 8.7% of total revenue from small group training. IHRSA’s Fitness Training Report provides an overview and analysis of both personal and small group training users. Overall, more than 8.3 million health club consumers used a personal trainer in 2016, representing 12.6% of total club consumers. Nearly 18 million club users engaged in small group training in 2016, accounting for 26.6% of total health club consumers. Although training has historically attracted consumers from higher income households, the report shows how small group training caters to health clubgoers from all income brackets. Small group training users pay an average of $33.96 per session. As expected, SGT users paid less per session than personal training clients. The average fee paid per small group training session was $33.96, while the average fee paid for personal training was nearly twice as much, at $65.86 per session. While cost may hinder more price-sensitive consumers from signing up for training, SGT offers some of the benefits of customized fitness instruction at an affordable cost. Whether at a club, gym, or studio, consumers from any income level can engage in SGT to help them reach their athletic, fitness, and wellness goals. SGT has near-equal penetration rates across most income brackets. IHRSA’s Fitness Training Report shows what most can expect regarding training utilization by income: consumers with annual household incomes (HHI) of at least $100,000 per year take up the largest share of training clients. More than two out of five personal training and small group training clients come from households with annual incomes of at least $100,000. However, when observed as a percent of consumers from each income bracket, SGT utilization is comparable across various income groups. 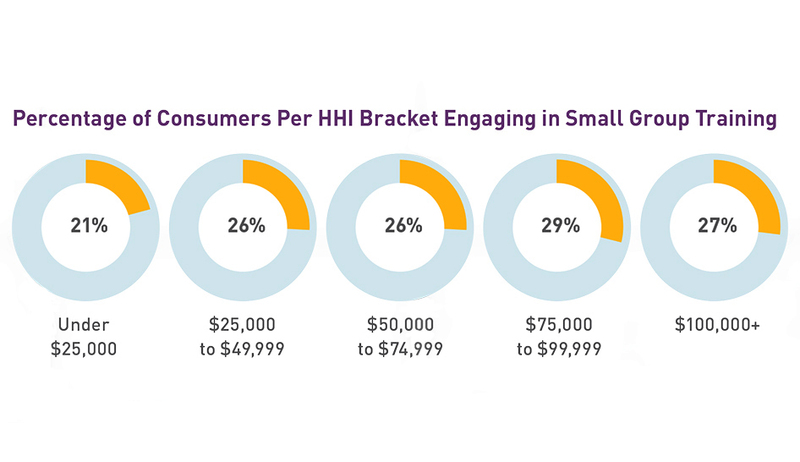 Roughly 27% of consumers with an annual HHI of at least $100,000 engaged in small group training, while 29% of health clubgoers with an annual HHI between $75,000 and $99,999 used small group training. SGT penetration rates for lower and middle-income brackets were similar as 26% of consumers from households ranging between $25,000 and $74,999 engaged in SGT. Small group training may serve as an “equalizer” in that it can attract consumers of various income levels to utilize customized instruction for an affordable fee. Although only 10% of consumers with HHI less than $25,000 used personal training, twice as many (21%) engaged small group training. Millennials claim the greatest share of small group training users. Millennials claim 37.4% of all SGT utilization, the greatest share across generational groups. It’s no surprise as Millennials are also most likely to belong to a specialized studio, which typically emphasizes small group training. Considering that most Millennials may not be in their peak earning years yet, the fact that they claim the greatest share of SGT attests to the potential of SGT to attract consumers on just about any budget.